Here is a link to my Newsletter about all things arty in my life. In February I was invited to give a demonstration of Mixed-media techniques to the Liverpool Art Society. I demonstrated using various collage materials (tissue, rice paper and fabric) glued on to gator board. This formed an interesting surface texture to which I applied overlays of acrylic paints. 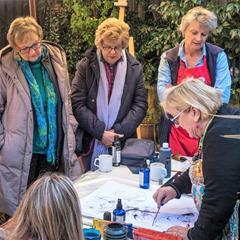 Again in February, I held a 1-day Painting Workshop at my Longueville Studio exploring how to develop your travel photos and drawings. 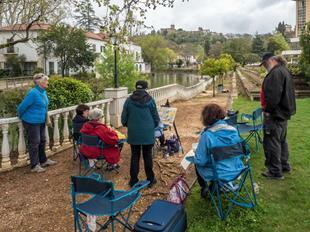 Everyone enjoyed a full day's painting broken by a lunch on the terrace. 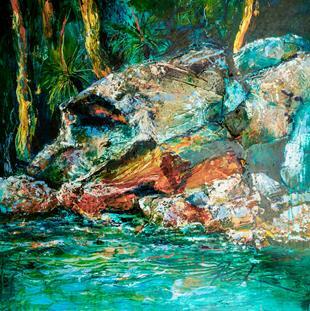 View the Online Catalogue of my paintings for sale. 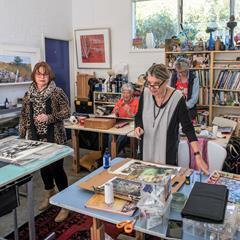 Pamela Fairburn's Art Workshops shall be held occasionally during 2019. These will be full-day workshops, each with a different theme. Various techniques will be explored. The aim is to have a full day of painting, commencing with a demonstration, experimentation with materials, tuition with drawing and painting and ending with a positive group evaluation and critique. Bookings now being taken (spaces are strictly limited). 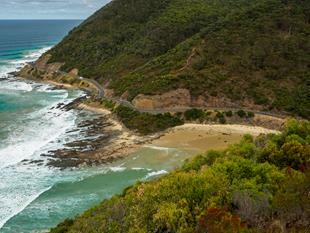 Explore the spectacular Great Ocean Road and the Otways, as well as magical Mornington Peninsular on this 10-day small group painting tour. 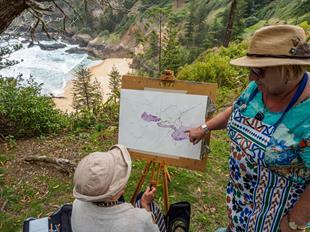 Staying for 6 nights at Lorne and 4 nights at Red Hill, we will venture daily to inspiring painting venues in some of Victoria's most scenic regions. Numbers will be limited to 10 clients, so if you are interested, contact me early to avoid disappointment. Download the Tour Brochure here. February 2019 Update: this tour is now fully booked. 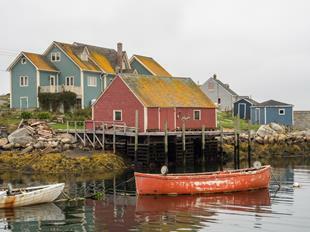 Join us on a 14-day painting tour to stunning Nova Scotia, Canada. 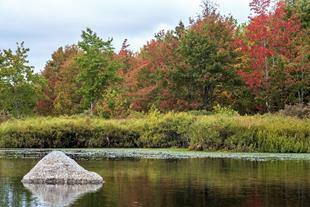 For an artist October is the perfect time to experience the landscape as it begins to change to its rich Autumn colours. We start in maritime Halifax with many opportunities to paint around the harbour boardwalks, as well as its historic Citadel and Public Gardens. Navigating to the west we arrive at Annapolis Royal which has some of the oldest timber buildings in Canada and a charming streetscape which is now a National Historic District. 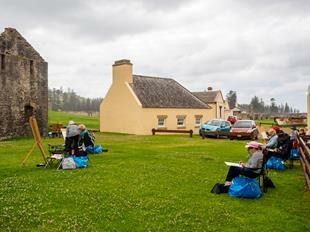 Our painting Workshops will include a visit to a fort from the 1700's and a captivating historic garden. We then travel inland to Trout Point where we will enjoy exclusive use of a luxury wilderness resort nestled in a Biosphere Reserve. During our relaxed stay our Workshops will be inspired by the pristine surrounds, with its unique wetlands, mossy rivulets, forest walks and tranquil lakes. Setting course for the coast again we arrive at the UNESCO World Heritage town of Lunenburg, with its original buildings from the 18th & 19th centuries. There will be plenty of time for our Workshops in this nautical environment. Returning to Halifax via the South Shore, we will discover lighthouses such as the famous Peggy's Cove Light and explore the rugged coastline with its vibrant yellow seaweed kelp. We hope you can join us on this Painting Tour to Canada ...… to 'Navigate Nova Scotia'. Tour details can be found here. Bookings are now being taken. I am on Facebook - Follow Me on Facebook! 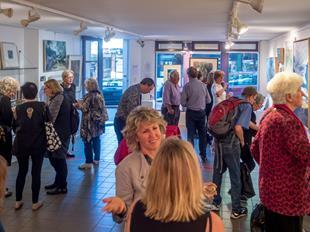 I joined 3 other artists, Marina Bishop, Chrissie Lloyd & Vicki Ratcliff, to mount a joint exhibition of our paintings, prints and mixed-media works. 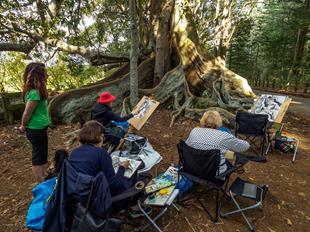 We led a group of 14 keen painters for a fascinating 7-day stay on unique Norfolk Island. 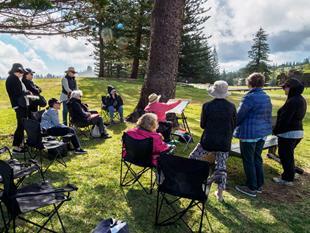 We enjoyed 5 en plein air Workshops at beautiful locations around the island. 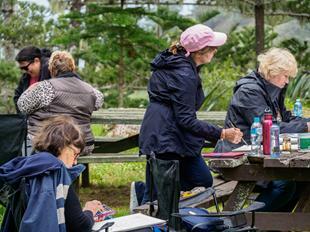 On the last cold day of June the Studio Courtyard was filled with rugged-up artists. 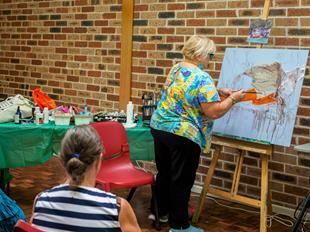 The Workshop theme was 'Figures in the Landscape' and we enjoyed experimenting with watercolour and acrylic paints. 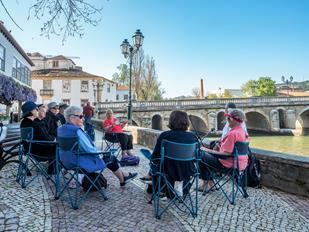 A group of 17 of us toured from Lisbon into medieval Portugal for 16 wonderful days. 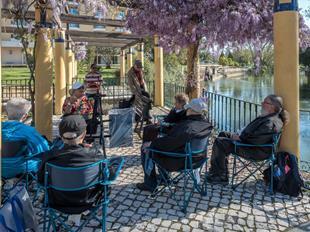 We visited Lisbon, Tomar, Vila Vicosa and Evora and enjoyed nine painting Workshops and much conviviality along the way. 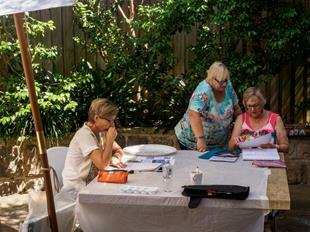 Everyone enjoyed learning new techniques in a fun and convivial atmosphere. Photos of the Workshop can be viewed here. Photos of the Workshops can be viewed here. 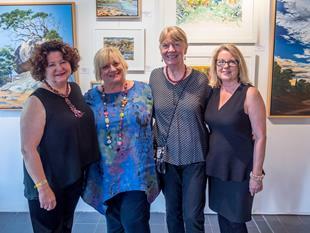 I was part of a successful 4-artist exhibition of paintings at the Lavender Bay Gallery, North Sydney. 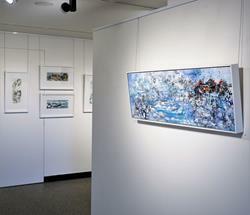 Artists included Susanna Chen Chow, Kay McFarlane, Hiren Patel and myself. 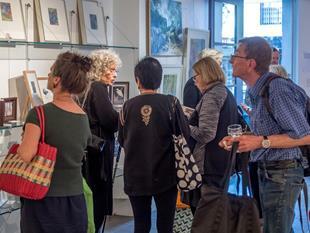 Photos of the Opening Night and the Artist's talks can be viewed here. 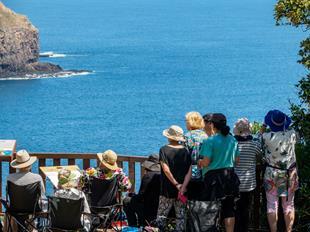 It was great catching up with everyone from the Kangaroo Island Painting Holiday held earlier this year. Over lunch everyone was able to reminisce and enjoy the memories of a great painting tour whilst thumbing through the Tour photobook. Photos from the Reunion can be viewed here. 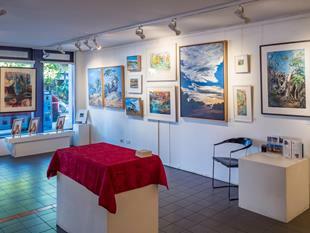 Opening Night photos at Gallery Lane Cove can be viewed here. Please contact me regarding painting sales. 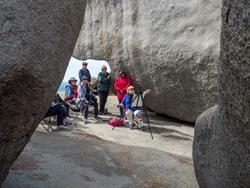 'Exploration, Experimentation & Expression' was the theme for this wonderful art tour to Kangaroo Island. 14 of us painted, explored, sampled and generally enjoyed the wonderful & unique environment of KI. 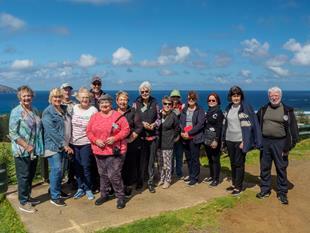 View photos from Part 1 of the tour - the western end of the KI, including our Wilderness Retreat, the Remarkables, Admirals Arch, Hanson Bay & Seal Bay. 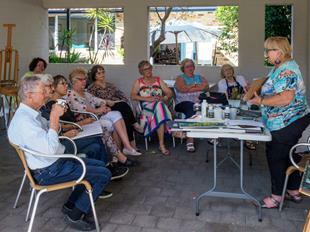 View photos from Part 2 of the Tour - Parndana, Stokes Bay, Figtree restaurant, Reeves Point, American River, Bernie Stonor Studio & Duck Lagoon. 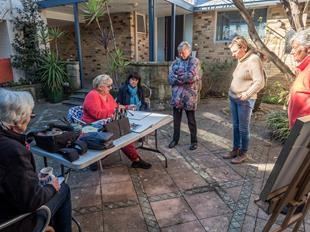 Artists, students & travelling companions all gathered for a Lunch in the Courtyard at Woodford Studio. Everyone bought a piece of work that they had created during 2016 for a 'show and tell'. Photos from the Lunch can be viewed here. 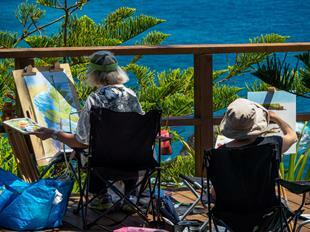 Our week-long visit to Fiji was thoroughly enjoyed by all the artists and non-artists alike. We enjoyed visiting & painting its exotic locations: beautiful beaches, stunning waterfall, local villages, the yacht club in Savusavu. Our friendly hosts at the Daku Resort met our every need and even called us 'family'. One-day Watercolour and Acrylic Landscape Workshops were held at my Studio. The workshops were limited to 8 participants who enjoyed exploring new techniques in a fun and convivial atmosphere. Two weeks of painting and touring southern Sicily were enjoyed in perfect spring weather. 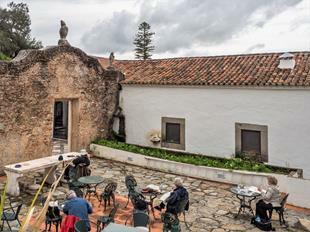 We loved our 12thC rural retreat near Ragusa with its stone courtyards and carob trees. We marvelled at the well-preserved Greek temples at Agrigento. The island of Ortygia city was our base for painting workshops amongst its ancient buildings. We finished our Tour in the vibrant hill-top town of Taormina which afforded opportunities to paint & drawing in the Greek theatre and to visit volcanic Mt Etna. View photos from the Catania section of the tour here. View photos from the Ragusa section of the tour here. View photos from the Ortygia section of the tour here. View photos from the Taormina section of the tour here. 30 good friends, students, artists and Tour Participants enjoyed a fabulous lunch at Ironwood, Woolwich. 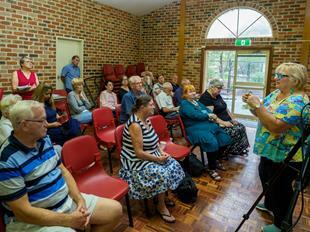 I was asked by Lane Cove Council to facilitate a Workshop as part of their new Festival by the River. 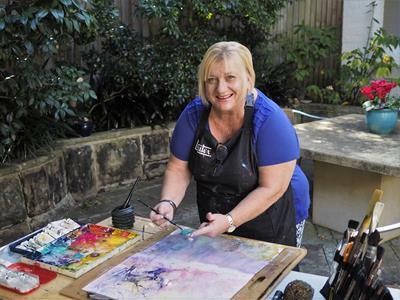 The workshop was run 4.00 -7:30pm in Aquatic Park, Longueville, beside the beautiful Lane Cove River. Photos from the workshop and some of the participants' works can be viewed here. 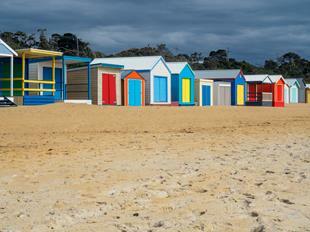 Ten days of painting and touring in Central Victoria were enjoyed by our 15 tour members. Taking advantage of beautiful Spring weather we visited and painted in Woodend, Hanging Rock, Hepburn Springs, Maldon and Daylesford. We enjoyed great camaraderie and stayed in stunning hotels. View the Tour photo albums below. 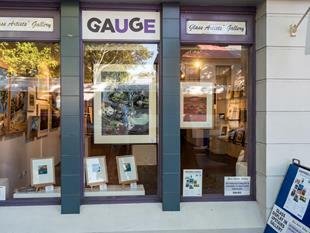 The reunion and exhibition of participants Works from our recent Colours of America Tour was held on a stunning Spring day at my Longueville Studio and 'pop-up' Gallery. We also handed out the 'Colours of Our Journey' photo book to the members of the tour as a momento of the wonderful Tour we all enjoyed. 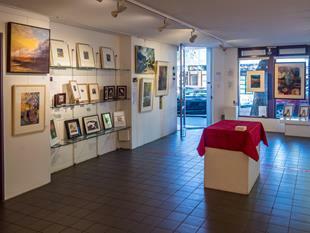 View the photos from the day here: Colours of America Exhibition. A 15 day tour of the spectacular canyon desert landscapes of Nevada, Arizona and New Mexico allowed the 17 tour members to paint and draw at scenic Grand Canyon, the red canyons of Sedona and adobe Santa Fe. Half the group then enjoyed a 4 day extension Tour to New York City to paint in Central Park and take in iconic galleries such as the MET, MoMA and the new Whitney. View photos from the Las Vegas section of the tour here. View photos from the Grand Canyon section of the tour here. View photos from the Sedona section of the tour here. View photos from the Santa Fe section of the tour here. View photos from the New York section of the tour here.